American and Southwest are raising fares by $5 each way, the latest move by airlines to reverse a price slump that has lasted nearly two years. American Airlines Group Inc. raised prices first and Southwest Airlines Co. followed suit on Thursday, according to J.P. Morgan Securities and FareCompare. Both airlines confirmed the price increase. Fares have been falling since airlines began adding flights and seats faster than the growth in travel demand. On Wednesday, Southwest Airlines Co. shares tumbled 8.5 percent after the company gave a weak forecast for a key revenue figure in the fourth quarter. The forecast suggested that lower fares are likely to last through year end. A new study says airlines are reading posts made by customers complaining over delayed or canceled flights and poor service, and are responding to those messages. 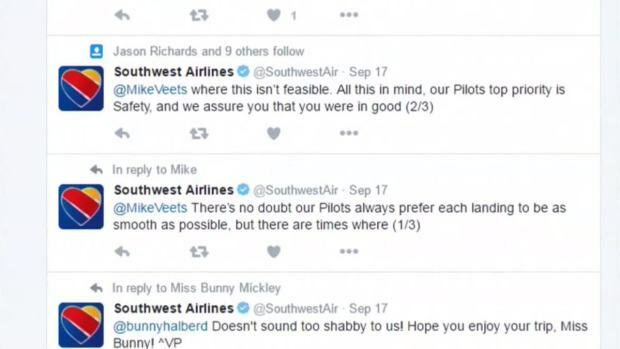 Dallas-based Southwest Airlines has a team tracking Twitter, Facebook and other online sites 24 hours a day. When a customer vents about a problem, a representative reaches out to them. "The approach is really how can we help, wait a minute we hate to hear that.... so what is going on, give us some information and let's see what we can do to straighten this out," said Lisa Goode, with Southwest Airlines. Social media teams help airlines by rebooking customers or by helping keep them more calm by relaying information when problems crop up. Even when airlines announce increases in their base rates, that doesn't mean customers pay more. Airlines run frequent fare sales, especially when demand is weak. Still, the fare hike led J.P. Morgan to upgrade Southwest shares to "overweight." Shares of Southwest gained 84 cents, or 2.2 percent, to $39.24; American rose 60 cents, or 1.5 percent, to $39.92; and some other airline stocks gained by smaller percentages.